Words are weaponized in Gloria by Brandon Jacobs-Jenkins, a selection from Mixed Blood Theatre’s Prescient Harbingers Trilogy of plays by black men that reflect on gun violence. A longtime female employee, who is also the title role character (a viscerally depressed Bonni Allen), has been chronically mocked and excluded by fellow publishing office underlings. 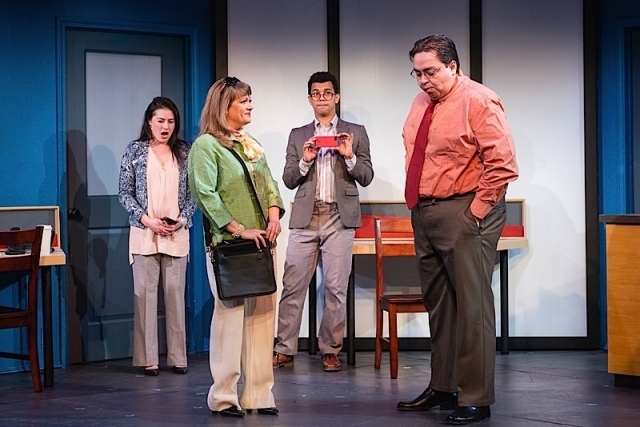 Dean (a disheveled Tom Reed), a self-pitying office worker whom the text seems to infer is gay, was the only co-worker who attended what was hoped to have been a big bash she threw the night before the play begins. Unfortunately, the bash ended up not being so big, much to Gloria’s deep disappointment. And I say “infer” because of various signals given. One such sign is the way Dean speaks about a Buddhist ego-tripper he once had a relationship with. Tellingly, he does not mention the person’s gender or name. Playwright Brandon Jacob-Jenkins has a sharp and brutally witty ear for office politics and the craven human impulse to shred the reputation of others—a lower angelic way to make one’s way up the prestige ladder. Gloria is certainly prescient in that regard. Moreover, Dean isn’t mocked for his gayness, but for his age. The insinuation: he hasn’t achieved a successful career and God forbid! He’s about to turn 30! Even young people have become the targets of ageism in the clerical food chain where one’s position is one’s identity. That said, one wonders if Dean’s gayness may be the unstated reason for the disdain some show toward him. Part of this hilarious comedy’s strength is in what we may suspect is underneath what is actually said. Kathryn Fumie crackles as Kendra, Dean’s Asian-American co-worker nemesis. Both actors deliver their antagonistic relationship with crackling treachery sharply poised on both sides. The playwright frankly observes the tensions between women and gay men in the dialogue, rather than the stereotype of assumed “sisterhood” between the two, imprinted in the collective consciousness in the Will & Grace era. Director Lavina Jadhwani’s excellent cast is like a perfectly oiled kaleidoscope in which you never know what might come out of whose mouth. It’s hard to predict just how the dynamics might reconfigure as scenes and moments unfold. Gloria dazzles with wild relationship contours that end up making perversely uneasy sense in the dehumanizing, if not, degrading world of office politics. The arrested development of educated adults psychologically stuck in middle school behavior patterns is shrewdly and tragicomically conveyed.